Some of you splendid readers might be scratching your heads over this full-page ad in today’s Boston Globe. 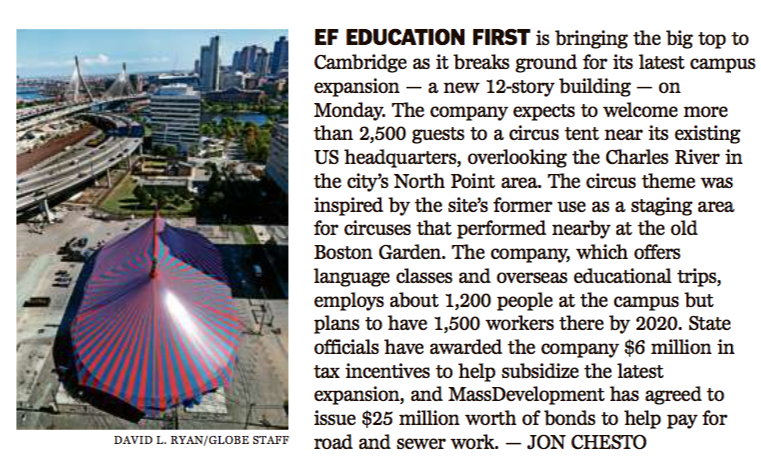 EF is Education First North America, which loves the Massachusetts Department of Conservation and Recreation for millions of very good reasons. Massachusetts Governor Charlie Baker and many Commonwealth and City of Cambridge leaders today joined EF Education First North America CEO Dr. Edward Hult to break ground on the company’s third new building in Cambridge’s North Point neighborhood, which will result in the creation of 300 new jobs, acres of new public parkland and recreational amenities, and a new permanent operations and maintenance facility for the MA Department of Conservation and Recreation (DCR). But wait, there’s more – this item ran in the Business section of today’s Globe, a sort of gift-with-purchase. Interesting that the press release didn’t mention the $31 million state handout, but, hey, you can’t have everything. Crosstown at the Boston Herald, however, they pretty much can’t have anything. 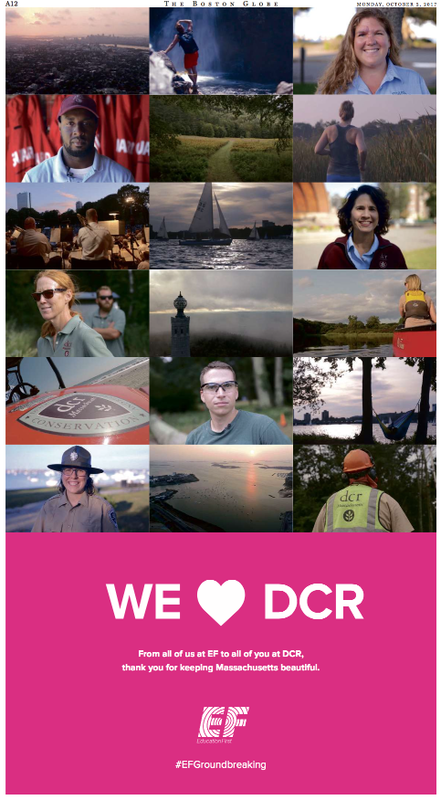 Education First might love the DCR, but it doesn’t care a fig for the thirsty local tabloid, presumably on the assumption that Herald readers aren’t interested in language classes and overseas education trips. Why anyone would pay the slightest bit of attention to pill-pushing has-been Scott Brown is a mystery to the hardreading staff. Why any newspaper would put him on its front page is an even bigger one. But then, we’re talking about the Boston Herald here. The flirty local tabloid has long carried a torch for the Accidental Senator, and today’s piece just fans the flame. 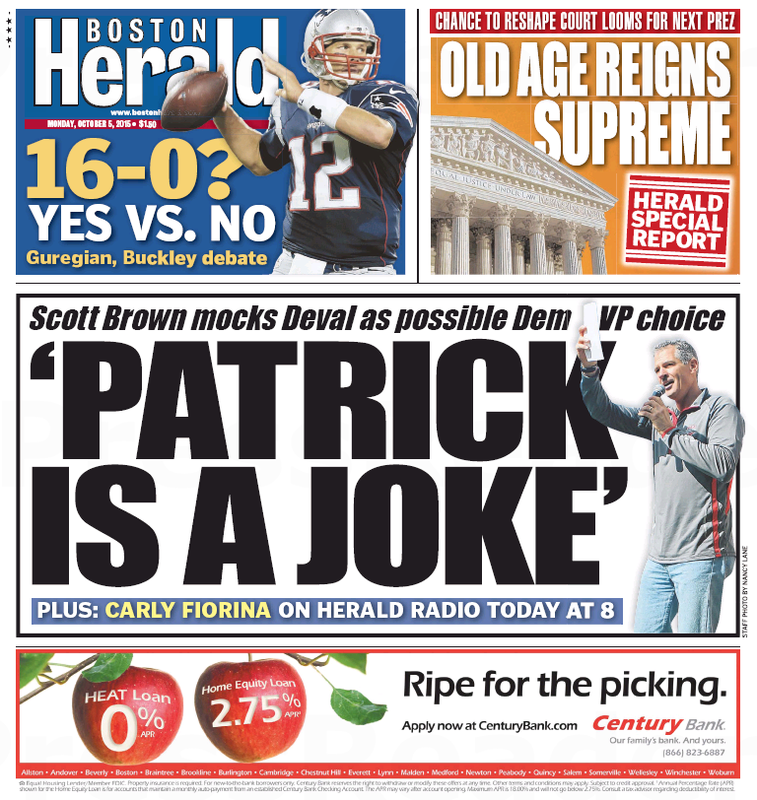 Former U.S. Sen. Scott Brown mocked the idea of a Deval Patrick veep run on a Joe Biden presidential ticket as a “joke” yesterday, but was quick to add he’d love to see the Democrats go with it. The offhanded dismissal drew rebukes from Granite State and Bay State Democrats, who insisted the two-term Massachusetts governor would bolster their party’s slate. Or charge $7500 a day for running. The only thing more ridiculous than the Herald’s news judgment is Carly Fiorina’s political judgment, which just produced this knee-slapper on the Herald website. Both Gov. 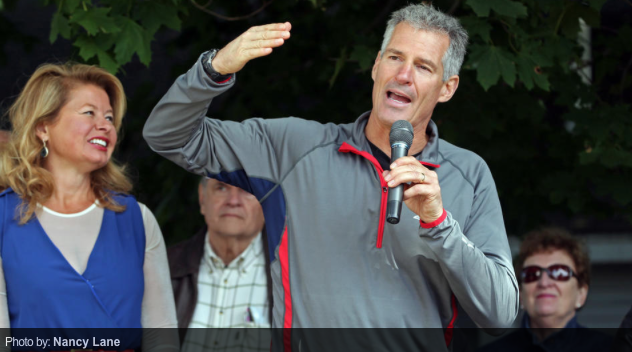 Charlie Baker and former Sen. Scott Brown could have positions within Republican presidential contender Carly Fiorina’s White House administration, the former Hewlett-Packard CEO told Boston Herald Radio this morning. 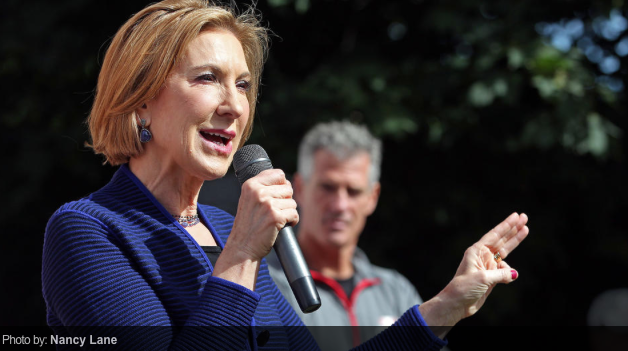 Fiorina added that Brown would also be on her “long list” of potential hires. Brown and his wife, Gail Huff, hosted an event for Fiorina yesterday at his home in Rye, N.H.
Hey, Scott ‘n’ Gail: That’s Carly’s bread-and-butter letter for your hospitality. Which is to say, just a formality. Don’t get too excited. We’re not sure which t-shirt Target is in the process of discontinuing, but the retail chain should definitely consider dumping its Free Brady knockoff, which got Massachusetts Gov. Charlie Baker in ice water yesterday (via Boston Daily’s Kyle Clauss). Anyone got a Free Baker t-shirt in the works? Boston Mayor Martin J. Walsh answered the ALS Ice Bucket Challenge thrown down by the governor — and may have one-upped him in the process. Gov. Charlie Baker doused himself with a bucket of ice water on the steps of the State House on Monday to raise awareness and money for ALS research, and as is customary, challenged others to join him, including Walsh. 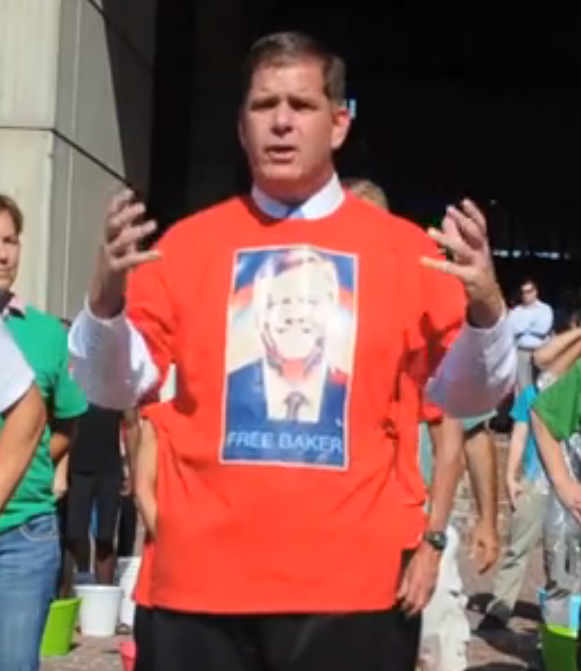 The mayor happily accepted, and yesterday he took the Ice Bucket Challenge outside City Hall, wearing a “Free Baker” T-shirt — a dig at the “Free Brady” T-shirt Baker wore earlier in the week. Okay then. Proves at least someone is listening. 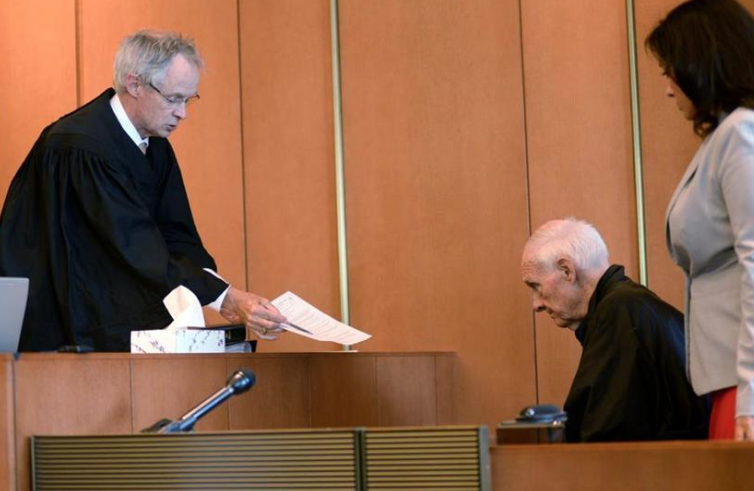 Here’s breaking news on the Target/Sully’s rumpus. Target introduced the Local Pride program to celebrate local communities, including our neighbors in Boston. 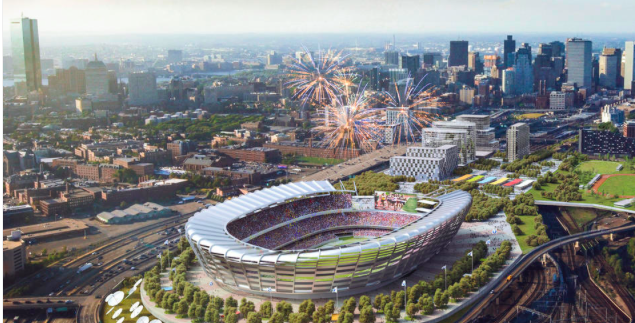 We have a deep appreciation for design, including respecting the design rights of others. We are in the process of discontinuing this t-shirt and will not carry it in future installments of the program. More, we’re sure, to come. P.S. It appears Target has dumped the Free Brady t-shirt, but kept the Green Monstah ripoff.